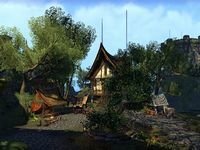 Tree-Ring Trading Circle is a marketplace in southern Woodhearth. The marketplace is situated on the central trading plaza. It consists of a mystic shop, which occupies its own building, a pack merchant stall, and a large merchant tent with a wagon beside it. One cooking fire is set up near Adaishir's tent, while another one is situated on the southeastern side of the market. An enchanting table can be found in Puzhbar-jo's shop. Adaishir's Trustworthy Goods — A general goods stall owned by Adaishir. Curious Curios — A mystic shop run by Puzhbar-jo. Earnona's Excellent Satchels — A pack merchant stall owned by Earnona.